Thermocoax Isopad IHH-ST1A/ST1D is a flexible heated hose for liquid and gaseous media with a maximum operating temperature of 100°C. 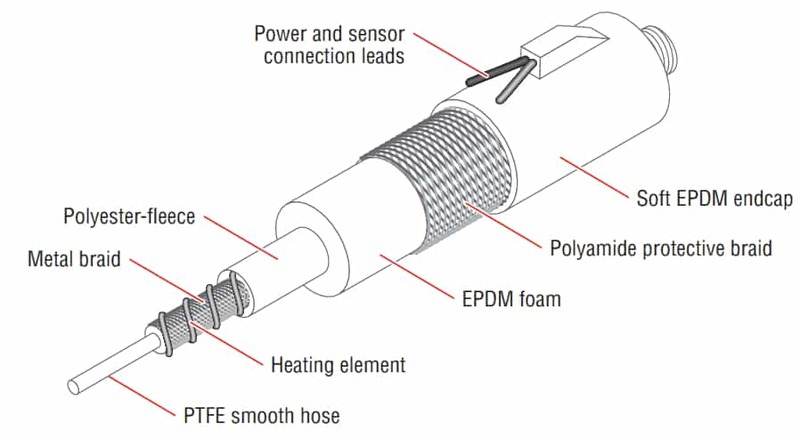 The standard versions of the IHH-ST1A/ST1D heated hose have smooth PTFE inner hose constructions with stainless steel braiding for pressurised operation. The thermal insulation consists of polyester fleece and ethylene propylene diene monomer (EPDM) foam and mechanical protection is provided by a polyamide braid and soft EPDM endcaps.